HTC's One packs a unique "dual-membrane" (or twin-membrane) microphone that the company says will allow you to capture clearer audio in loud situations. In other words, if you're at a concert and record a video your audio likely sounds pretty awful because there's so much noise coming into the mics. 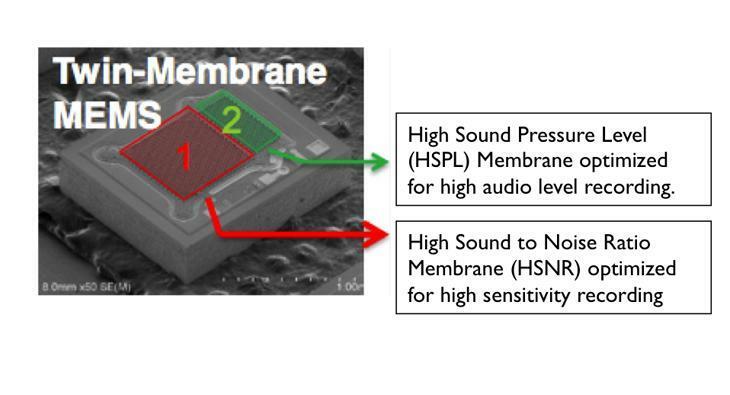 HTC's dual-membrane solution will attempt to clear up the noise so that you have clean audio. High sensitivity, which impacts sound quality at very low volumes (as measured by Sound to Noise Ratio (SNR)). Increased capability to capture high audio levels, which impacts recordings at high volume (as measured by Sound Pressure Level (SPL)). "With the introduction of BoomSound in the new HTC One, we solve this challenge by delivering two dual-membrane MEMS microphones to record audio," the company explained. "Why does this matter? With this design, each membrane serves a specific purpose, one focused on high-sensitivity while the other is focused on high sound pressure." Then, when a user goes back to play the audio the recording from both membranes is played back, hopefully eliminating the background noise.